Mt. 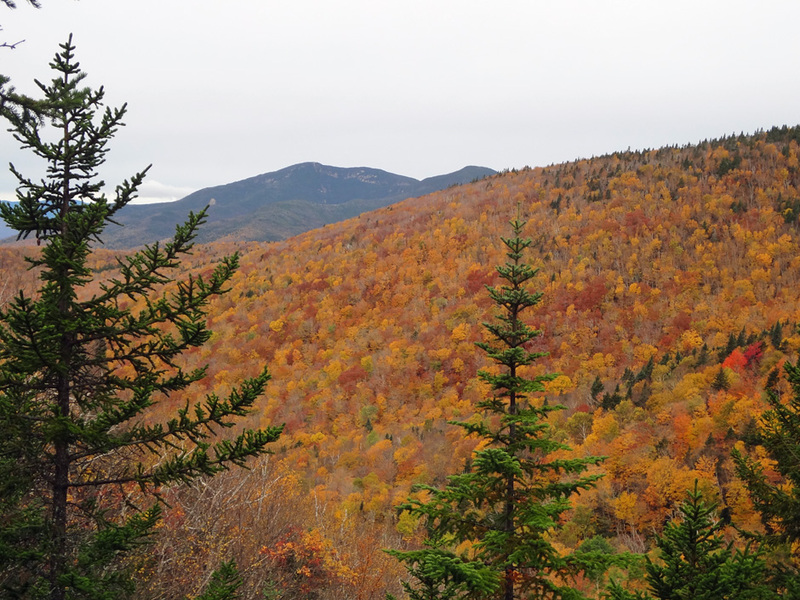 Tripyramid, a three-headed mountain monster, kills two peaks off the New Hampshire 48 over 4,000 feet bucket list with one tremendous hike. Just be careful not to break your neck in the process. The gnarly rock slabs on the steep North Slide are a bunny slope for rock climbers, but for anyone accustomed to ascending mountains sans rope and harness, this hike will put hair on your chest and lead in your pencil. In all seriousness, the Mt. Tripyramid Trail can be dangerous if proper caution isn’t taken. Those intent on doing the loop should ascend via the North Slide because going the other way is, quite frankly, crazy. The loose gravel on the South Slide also makes that section better for descents. If self-preservation is more your style, consider the Scaur Ridge Trail for an easier, albeit slightly longer, alternative to the North Slide. For all this tough talk, the Tripyramid loop hike is very much Jekyll and Hyde. It begins with Jekyll on the Livermore Trail, a leisure 3.6-mile walk on the gravel Livermore Road. Along the way, there are various well-marked side trails, including a short jaunt to the Norway Rapids at the 1.8-mile mark. The south end of the Mt. Tripyramid Trail is reached at 2.6 miles. Keep going straight here to access the North Slide. While mountain biking the Livermore Trail portion of this hike may seem like a good idea, doing so disqualifies the North and Middle peaks from counting on the 4,000-footer peak bagging list. The Livermore Trail may not seem like much of a climb, but an elevation of 2,400 feet is reached where the north end of the Mt. Tripyramid Trail diverges. Here the trail cuts down a bank, crosses Avalanche Brook and enters the Sandwich Range Wilderness. The North Slide is reached a half mile from the Livermore Trail. Hyde enters the picture here with rocks and gravel that quickly turn into steep slabs. At first the slabs are walkable but soon all hands are needed on deck. Footing is tricky, especially if there has been any wet weather. Overall the slide is what-have-I-gotten-myself-into steep, gaining 1,200 feet in only a half mile. It’s best to employ a buddy system on the North Slide and to avoid this section altogether in inclement weather. The lower portion of the slide is under tree cover and can remain slippery well after storms pass. The upper part returns to a composition of loose rocks and gravel but doesn’t budge an inch on the steepness. The North Slide ends abruptly from which the trail exits on the left, continuing the climb for a short distance before reaching the intersection with the Pine Bend Brook Trail. Turn right here to follow the loop across the North Peak (4,180 feet), Middle Peak (4,140 feet) and South Peak (4,100 feet). The trail across the three peaks is fairly easy with moderate ups and downs; however, only the Middle Peak affords any scenic views. The descent from the South Peak is steep with some awkward rocks to traverse at the beginning. Once onto the South Slide the trail turns to loose gravel that presents a fun challenge in its own right. Don’t fret, though, for Jekyll is back at the bottom of the South Slide with a nearly two-mile hike along old logging roads that parallel and cross several brooks. The Mt. Tripyramid Trail portion of the hike ends by once again crossing Avalanche Brook and returning to the Livermore Trail. From here it’s 2.6 miles back to the parking lot. Take I-93 to Exit 28 in Campton and follow 49 East for a little over 11 miles. Turn right onto Boulder Path Road followed by a left turn onto West Branch Road (the turn is opposite the Osceola Library). Drive o.7 mile further and turn right into the Livermore Road parking lot, which is a White Mountain National Forest fee lot. This about as tough as it gets on the Livermore Trail, aka Jekyll portion, of the Mt. Tripyramid loop hike. The Norway Rapids are just .01 mile off the Livermore Trail and worth a visit. The view of Mt. Osceola (right) and Mt. Tecumseh with Waterville Valley Ski Area as seen from the North Slide. The rocky upper portion of the North Slide. It looks (and seems) like it goes on for infinity. Spruce grouse in the White Mountain National Forest are in no hurry to budge. A portion of the Mt. Tripyramid Trail between the North and Middle peaks. Another view of Mt. Tecumseh and Waterville Valley from the Middle Peak of Mt. Tripyramid. Looking east from a view point on the Middle Peak. The easier (relatively speaking) South Slide on the Mt. Tripyramid Trail loop.